Although it hasn’t been long since Meliora Weekend 2014 came to a close, I know that many of us are already looking forward to next year’s weekend. That is why I am excited to announce that in just four months you will have the opportunity to celebrate the spirit of Meliora again. 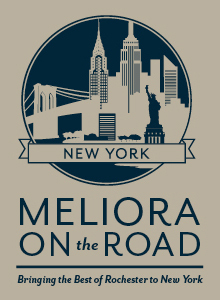 On April 18, the University will launch its new program, “Meliora on the Road: Bringing the Best of Rochester to New York.” I invite all of you to join me at the Westin New York Grand Central for this all-day event that will include a luncheon featuring remarks from President Joel Seligman and a keynote address from Steven Chu ’70, ’98M (HNR), former U.S. Secretary of Energy to the Obama administration and co-winner of the 1997 Nobel Prize for Physics. Please be sure to read the “Upcoming Events” section of the newsletter for more information. Part of the reason we create events like “Meliora on the Road” is to thank you for your membership and contributions. If you are unable to attend due to distance or other reasons, please know that we are planning other events across the nation for 2015. On behalf of the University of Rochester and the George Eastman Circle, I would also like to wish you a wonderful holiday season full of family, friendship, and celebration for all that you have accomplished. I am filled with gratitude for your leadership and enthusiasm for what you will help us accomplish in 2015 and the years ahead. In October, we were delighted to announce that our membership around the world had gone beyond 3,000. It is because of this amazing group’s support that we are able to help so many people in so many different ways. New members, established members, and those of you renewing your membership—thank you for your remarkable support. Here’s to an “ever better” 2015! All of our George Eastman Circle members have wonderful stories to share. In this issue of our newsletter, we are pleased to feature two Charter Members who support the Memorial Art Gallery. Art has always played an important role in Mary Ann Monleyand William (Bill) Rice’s lives. They both took art classes in college, which instilled a lifelong appreciation for art and how it connects people from all walks of life. Art even brought them together—they met each other at the Memorial Art Gallery. In her role as administrator of Volunteer Services and Tours at the Gallery, Mary Ann interacts with visitors and volunteers of all ages and backgrounds. She especially enjoys interacting with children and their teachers and chaperones who are visting from school to take tours of the Gallery. She also lists training docents among her favorite parts of her job. Other favorites include Gallery programs such as the Family and Community Days, which offer Rochester area families and community members an opportunity to learn more about specific cultures through a variety of activities and cultural displays; the new Art at the Bedside program at Monroe Community Hospital; and Meet Me at the MAG, a monthly art therapy program for Alzheimer’s patients and their care partners that is now in its fifth year. Mary Ann is also a member of the Gallery Council, where she participates in events and ensures volunteers feel appreciated for all the work they do for the Gallery. 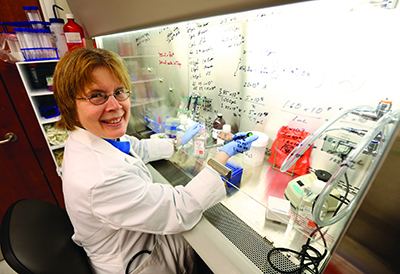 Jane Liesveld, M.D., a professor in the Department of Hematology/Oncology, focuses her research on how cancer develops in bone marrow, which is translated to treatments for the patients she cares for each day. Your commitments helped provide students with critical scholarship support and much more. Unrestricted support continues to attract the best students, ensure resources are available for performances, and enable other opportunities and innovative programs. Your gifts helped launch a new cancer survivorship program and helped enhance the Institute in a number of other ways. The George Eastman Circle is also happy to announce thatThompson Health is now a fund to which members can designate their support. In the past, members have received a printed version of the George Eastman Circle Honor Roll in the mail. This spring, the new Honor Roll will be published entirely online, on our website. The switch to a digital Honor Roll was made in response to member feedback and as part of a comprehensive effort to reduce our carbon footprint and expenses. In its electronic form, the Honor Roll will continue to serve as a way for the George Eastman Circle to recognize its members’ commitment to philanthropy at the University on a yearly basis. 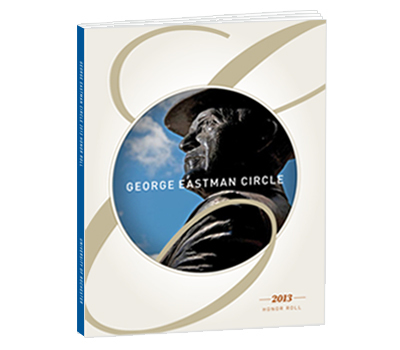 As George Eastman Circle members, your commitment to philanthropy makes you leaders within the University community. Your annual support provides critical funds that enable world-class research and health care and create countless academic opportunities, which advance our mission toLearn, Discover, Heal, Create—and make the world ever better. Below are members who have made significant Campaign gifts in addition to their membership commitments. With a $1 million commitment, the Andrew P. Barowsky Foundation established a fellowship for students of Dominican University of California pursuing graduate degrees at the University of Rochester. Charter Member Andrew P. Barowsky ’72, president of the Barowsky Foundation, began serving on the board of trustees at Dominican University in 2004, where he currently serves as chair. Andrew seeks to promote academic advancement by creating a path between Dominican University and his alma mater. You can read more about Andrew and the gift from Barowsky Foundation in theofficial press release. C. McCollister “Mac” Evarts ’57M (MD), ’64M (Res), Distinguished University Professor and former CEO of the Medical Center, made a $1 million commitment to establish theDr. C. McCollister Evarts Professorship in Orthopaedics. Dr. Evarts is creating the professorship to help the University recruit and retain exceptional faculty in the field of orthopaedics. The inaugural Evarts Professor is John T. Gorczyca, M.D., director of UR Medicine’s Orthopaedic Residency Program. You can read more about Dr. Evarts’ gift and John Gorczyca in the October issue of Fast Forward. 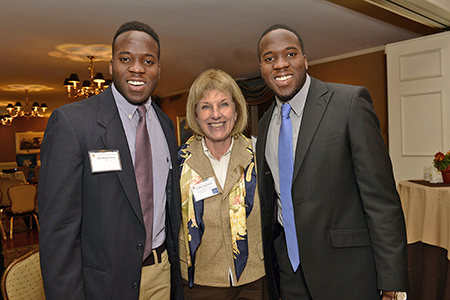 In 2004, University Trustee Cathy Minehan ’68, P’04 and her husband, Jerry Corrigan established the Cathy E. Minehan and E. Gerald Corrigan Endowed Scholarship. The two George Eastman Circle Charter Members recently added an additional $1 million to their scholarship, creating even more opportunity for University students. The scholarship provides assistance for students in the School of Arts & Sciences. Recipients must have significant financial need, with preference given to underrepresented minorities and/or athletes in good academic standing, and to those pursuing faculty-directed research in the social sciences. You can read more about Cathy and Jerry’s gift in the official press release. On October 15, University Trustee Larry Bloch ’75, P’13Sand his wife, Cindy Bloch P’13S, were recognized for their generous support of the University’s Advancement program at the formal dedication of the Larry and Cindy Bloch Alumni and Advancement Center. 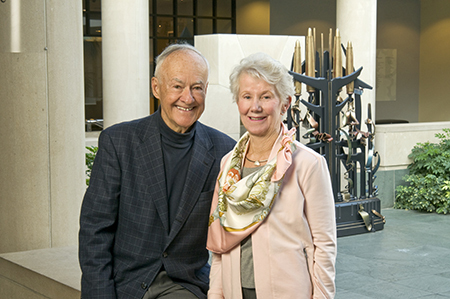 The Blochs, Charter Members of the George Eastman Circle, became the Center’s namesakes in recognition of their establishment of the Larry and Cindy Bloch Endowment for University Advancement in April. You can read more about the dedication ceremony in the October issue ofFast Forward. An investiture ceremony was held at Kodak Hall at Eastman Theatre for Charter Member Jamal Rossi ’87E (DMA), the Joan and Martin Messinger Dean of the Eastman School of Music. At the ceremony, a fellow member and one of the namesakes of Dean Rossi’s endowed position was also recognized. University Life Trustee Martin Messinger ’49received the Eastman School of Music’s Luminary Award for his extraordinary service to music and the arts at the local and national levels. You can read more about the investiture ceremony in the November issue of Fast Forward. Through a dedication to philanthropy, the George Eastman Circle is helping to shape the future of the University and touching lives around the world. Your five-year commitments are providing critical budget-relieving annual funds to specific schools and units of the University and its Medical Center and, ultimately, strengthening the University’s ability to make a profound impact on society. George Eastman Circle members are also invited to a special reception with Steven Chu from 5:30 p.m. to 7 p.m.
Join us for a day of ideas, conversation, and connections, highlighted by faculty and student speakers from across the University. 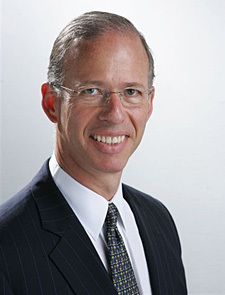 The day will also include a luncheon featuring remarks from President Joel Seligman and a keynote address from Steven Chu ’70, ’98M (HNR), former secretary of energy to the Obama administration and co-winner of the 1997 Nobel Prize for Physics. More information will be sent by invitation in February; you can also contact the Office of Donor Relations at 800-281-2055.